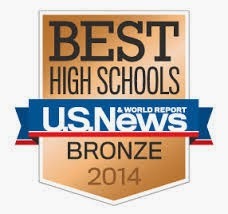 The Eden Prairie high school ranked high on a list of America’s most challenging high schools. Emma Marais, a senior at the International School of Minnesota, took four Advanced Placements classes as a junior and will have completed four more by the time she graduates this year. That may sound like a hearty load, but Marais isn’t an outlier at her school by any means—in 2012, 84 percent of ISM students in grades 8 through 12 took three or more AP classes, and the school offers a total of 19. It’s no surprise that the school ranked high on the Washington Post’s recent list of America’s most challenging private high schools, placing seventh in the nation and first in Minnesota. The Post tabulated the list by dividing the number of college-level tests given in 2012 by the number of graduates. Of course, there’s a rigorous public school in our community, too: the Washington Post ranked Eden Prairie High School as the 11th most challenging school in Minnesota.